Geology Field Trips: Layers, Layers, Layers. This convex fault was especially cool for us because the Green River cuts perpendicular to this huge fold. How could the river do this? It seems it should go around it. But here is the part of the story that was left out: The Uintas were eroded and covered between about 30 and 12 million years ago. The Green River established its course on this flat landscape. Then the land began to uplift again. This time it didn't fold, just slowly elevated. 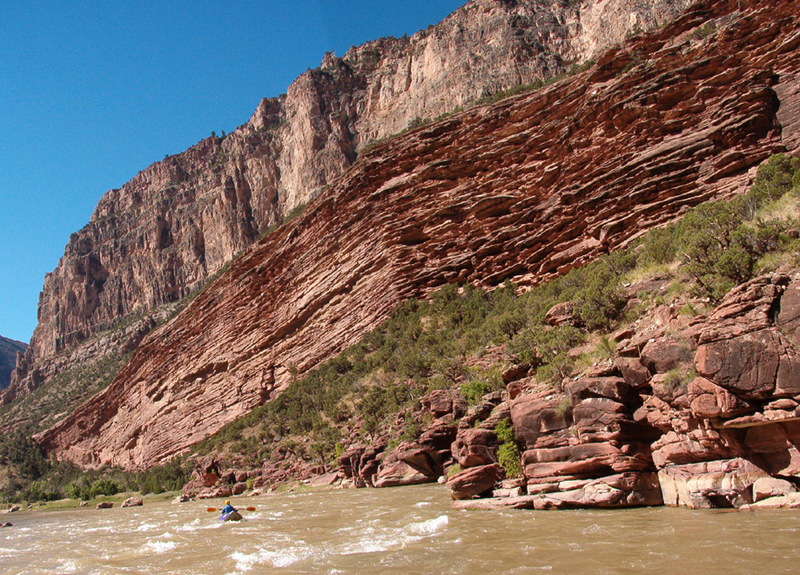 This uplift caused the Green River to erode downward. It was able to cut through the Uinta Arch because its course was already established across it. This is called superimposed drainage. 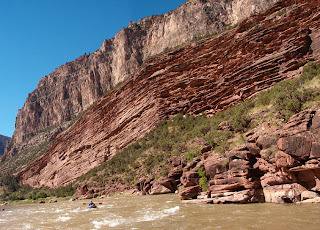 One of our favorite layers that we saw came near the meeting of the Yampa and Green Rivers. The rock looked like a giant steam boat. In fact, they called it Steamboat Rock. The rock looked cool, but there was in fact some geological significance to it too. It was an entrenched meander, which means there was a bend in the river that curved back around til it was very near to the place where it turned, only separated by a peninsula of land. Other than the joy of rafting, this was our favorite part of the trip. We really enjoyed all the cool geology we saw. We enjoyed watching and learning about the different layers and how they formed to create the shapes they do today. Plus, we got to go river rafting! It was one of the best trips ever!